The Chicago Avenue bus turnaround station at Austin Boulevard will house a public art display commissioned by the Chicago Transit Authority. The $200,000 project is the first public art project CTA has commissioned for one of the city’s bus terminals. Artwork has been on display at train and bus stops since 2011, part of Mayor Rahm Emanuel’s CTA public artwork’s initiative. Some 60 works, from sculptures to mosaics, are located at various stations across the city. Abstract artist Shinique Smith of New York will work on the Chicago Avenue project. 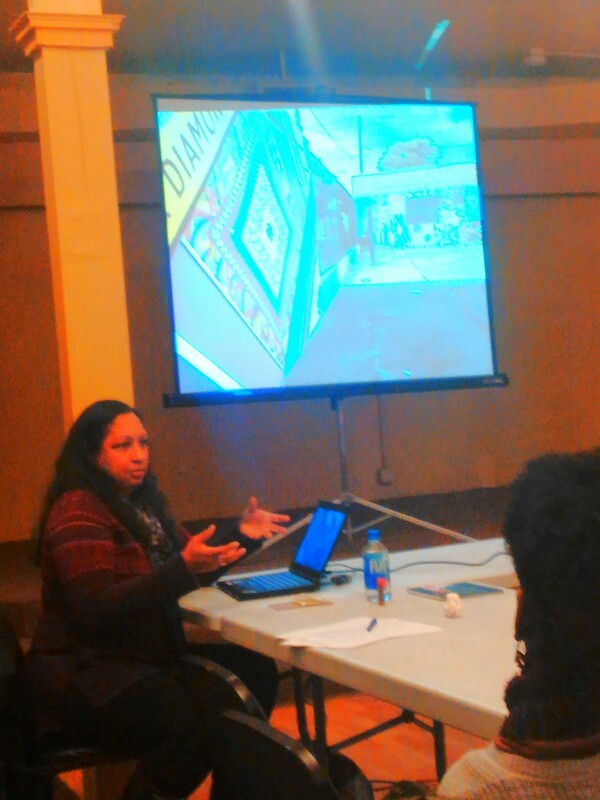 Smith, who was hired by CTA in September, discussed the project with and got ideas from Austin residents at a community meeting earlier this month, held at Sankofa Cultural Arts Center, 5820 W. Chicago Ave.
Smith, a Baltimore native based in Brooklyn, has previously done public artwork in cities, including Los Angeles and Aspen, Colorado. This is her first time working on such a project in Chicago. Smith’s technique involves “found” objects and old clothing used in her works, which includes paintings and stand-alone sculptures. Her love of fabrics began with her mother, who made clothes and took Smith to fabric shops as a child. Smith said her artwork involves telling a story as well as aesthetics. “My work is sort of a narrative. There’s always history involved in my work, even if it’s abstract with bits and pieces of clothing and fabrics,” she said. The dozen or so attendees at Sankofa wanted the Chicago Avenue project to tell Austin’s story and highlight the community’s history. “The African-American history is very important, but not just the African-American people but also all those different people who have come through the community and have history here,” said Malcolm Crawford, co-owner of Sankofa and executive director of the Austin African American Business Networking Association. Transforming Chicago Avenue into a “Soul City Corridor” featuring art and entertainment has long been in the works for AAABNA, Crawford said. “Having a place for African-Americans to showcase their culture and just the beauty has always been my passion,” he said. Residents also want the Chicago Avenue project to highlight the African-American experience of the neighborhood, perhaps including photos or other objects donated from local folk. Smith said she doesn’t yet have a specific design in mind but wants to include ideas from the community. CTA public art projects typically take a year to 18 months to complete, said Elizabeth Kelly, project coordinator for CTA. The city has hired local and out-of-state artists to work on projects, Kelly said. Funds for the Chicago Avenue project is provided by the Federal Transit Administration. CTA will OK the final design, but residents at Sankofa asked to be included in the decision-making process. Kelly said that’s not normally done but will take that suggestion back to CTA for consideration. The Chicago Avenue bus turnaround presents a challenge for public art because it’s an open space with no surrounding back walls or structures. Because of the large open space, residents suggested making the artwork somehow functional, like including benches for people to sit on. Smith said she was open to that idea. Smith and the residents acknowledged some of those challenges, but Smith expressed optimism in coming up with a workable design. The seven - all located along Chicago Avenue, the "Soul City Corridor" - are receiving more than $558,000 out of $5 million being distributed citywide under the new Retail Thrive Zone program.